Just when I thought the Sunday Supper group couldn’t get any more creative with choosing a theme. These Tantalizing Trays will have you all crazy over deciding which dish your going to make for your next gathering, cookout, party or just for a good ol’ fashion snack! This event is being hosted by Conni over at The Foodie Army Wife, thanks so much for gathering us around your family table this week Conni! I knew what I wanted to make when I first found out about this event. I put a spin on an old family favorite. Each Christmas we’d all bring an appetizer or dish of some kind. My aunt would always bring her cucumber sandwiches. I’ve made them so many different ways lately it’s gotten real fun. No matter what I always get compliments on them. To top it all off it’s healthy too! Anyone who knows me knows that I love entertaining, if your anything like me this is the perfect tray to bring to your next party! Some grocery stores sell Pepperidge Farm’s Rye bread in a square form that comes in the perfect package for these sandwiches. I haven’t been near a grocery store since I moved that sells them so I have been improvising by buying Rye bread and using a circle cookie cutter to cut out the sandwiches. I also use the crusts to make homemade croutons! Get creative if you’d like to use different shaped cookie cutters. I’m going to try and make these in cute shapes to see if I can get my picky daughter to eat a few! Using a circle cookie cutter, cut a circle in each slice of bread. Save the crust for croutons! 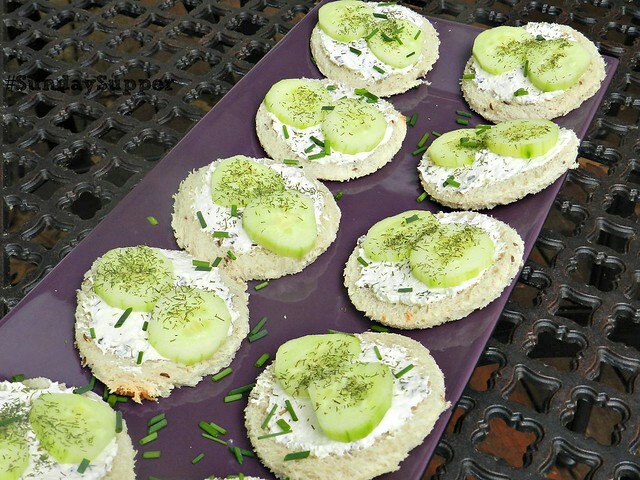 Spread 1-2 tbsp of cream cheese on each circle. Place 2 cucumbers on each sandwich, if you have a large regular cucumber you may only need one. 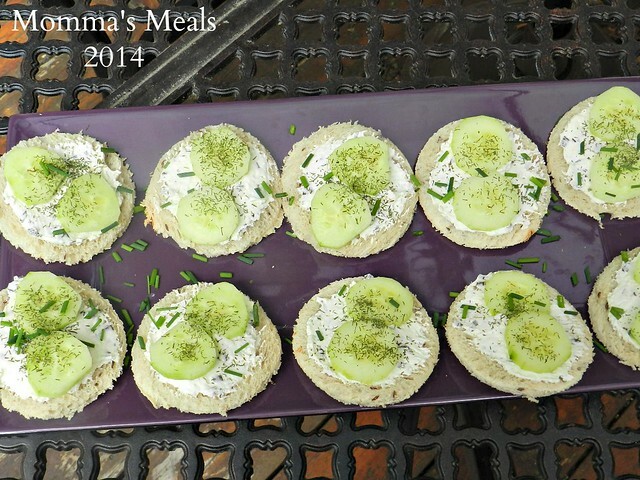 Sprinkle dill (or use fresh dill!) on top of each sandwich. Garnish with fresh chives and refrigerate until your ready to serve. Mix cream cheese with a packet of ranch dressing and spread on top of bread. Mix cream cheese with a packet of italian seasoning and spread on top of bread. OK lets see what other Tantalizing Trays were brought to this weeks family table! I haven’t had a cucumber sandwich in ages. I think cutting the bread and cucumbers into shapes would be fun too. Nice little treats. Thank you. 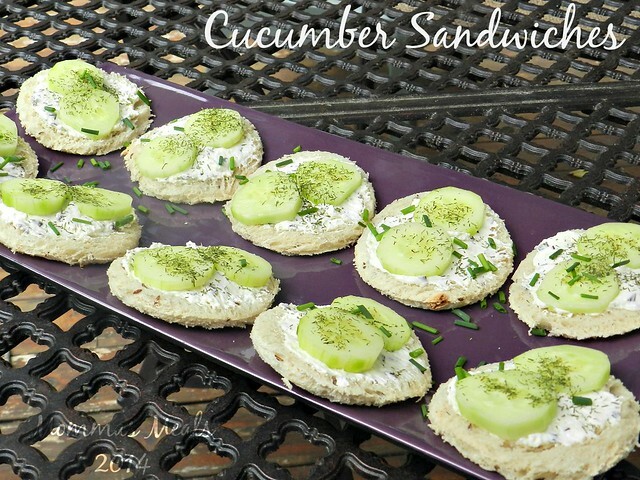 I love cucumber sandwiches…yours look just perfect!!! Love these! A friend actually brought these to a party recently. They reminded me if my younger days and cucumber sandwiches for lunch! what a fun shape really! Love the classics! Love these with tea in the mornings! I love it! These are great little sandwiches and so pretty. This is such a simple yet delicious appetizer. I would keep going back for more! Such GREAT themes, right? I just love the flavors in this refreshing sandwich–it gives me hope that summer isn’t quite over–er, yet. I’d eat this all year round, thanks for sharing it! I love cucumbers they’re so refreshing!